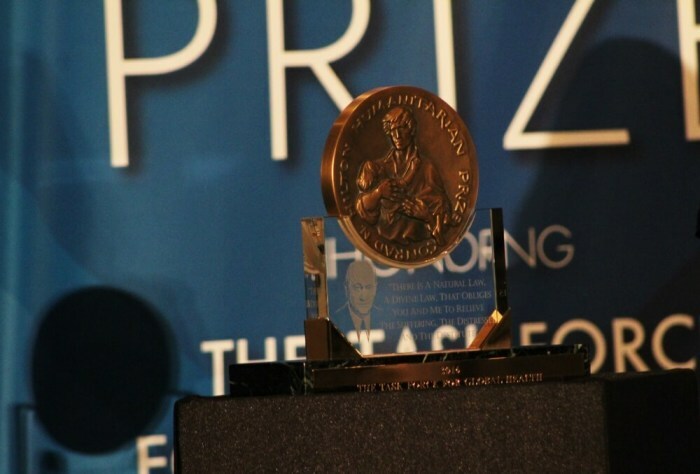 NEW YORK – The Task Force for Global Health, a Georgia-based international nonprofit focused on improving the health of vulnerable populations around the world, was recognized for their work Friday with the world's largest humanitarian award, the Conrad N. Hilton Humanitarian Prize, which comes with a $2 million purse. The annual award which is administered by the Conrad N. Hilton Foundation, was established in 1996 to recognize and advance the efforts of recipient organizations and raise awareness about the worldwide need for humanitarian aid and encourage others to expand their support. Recipient organizations can come from anywhere in the world but must be judged to have made extraordinary contributions toward alleviating human suffering. In accepting the prize at an awards ceremony held at the iconic Waldorf Astoria New York, Task Force President and CEO David Ross, impressed on an audience of international dignitaries and leaders from the humanitarian and human rights fields, the need for what he called "consequential compassion." "It's not enough to feel that something needs to be done to alleviate suffering and disease and childhood mortality. All of us in this room and many, many people around the world feel that way. At the Task Force, we believe that we have a responsibility to act, to help those most in need. That is our mission. It is to act," he said. Ranked by Forbes as the fourth largest charity in the U.S. in 2015 with $1.7 billion in revenue, Ross described the work of the Task Force, as "enormous" and highlighted the relationship between public health and poverty among underserved populations. "We know that good health is a challenge for the world's poor who struggle to meet the basic necessities of life including access to adequate food, clean water and basic health services including vaccines and medicine. Poverty put people at greater risk for a host of diseases that have long been conquered in other parts of the world. These diseases cut lives short and cause untold suffering. But they do more than that," he said. "They burden people's health. They take away one's ability to take care of their families. They rob children of education and therefore a better future and ultimately they help trap people in poverty." He explained how the Task Force works to build coalitions through partnerships with public and private entities to advance access to good public health then shared how the organization planned to use the prize money. "You may be asking yourself what are we going to do with this wonderful prize money. As I've said to all of my colleagues, I really didn't expect it. This is a very lovely problem to have to deal with but not one I thought I would be dealing with," he said to chuckles from the audience. "Because of our unexpected and somewhat unprecedented growth in recent years, due to the success of our programs, we have to acquire more space in Atlanta, so we'll be using the Hilton Prize to help us purchase a new facility," he said. "That new facility will help us unlock our capacity to help more people. We also see this as a facility serving as a new hub for global health in the Atlanta area by bringing together organizations who together with us can help solve complex problems. The additional space also gives us the capacity to move into other areas of global health need particularly non-communicable diseases and injuries," he continued. "Ultimately, we're trying to work ourselves out of a job. Our goal is to help those who can't help themselves," he said. "When they can do that, we can turn off the lights and go home." The Conrad N. Hilton Foundation was created in 1944 by international business pioneer Conrad N. Hilton, who founded Hilton Hotels and left his fortune to help the world's disadvantaged and vulnerable people. The Foundation currently conducts strategic initiatives in six priority areas: providing safe water, ending chronic homelessness, preventing substance use, helping children affected by HIV and AIDS, supporting transition‐age youth in foster care, and extending Conrad Hilton's support for the work of Catholic Sisters. Since its inception, the Foundation has awarded more than $1.5 billion in grants, distributing $107 million in the U.S. and around the world in 2015 alone. The Foundation's current assets are approximately $2.5 billion. The Foundation announced in September that the nomination period for the 2017 Conrad N. Hilton Humanitarian Prize is now open. 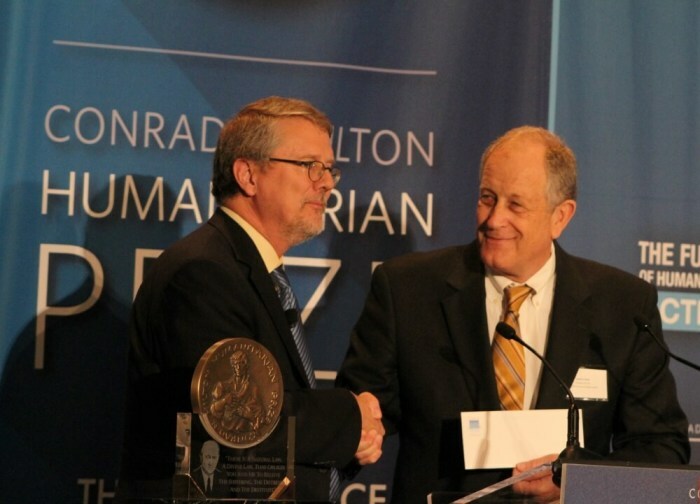 "The Conrad N. Hilton Humanitarian Prize has helped fuel the success of world‐class nonprofit organizations in their efforts to alleviate human suffering," Hilton Foundation President and CEO Peter Laugharn said. "It is a tremendous honor and opportunity to bestow the Hilton Humanitarian Prize on such deserving organizations, and we look forward to doing it again in 2017." Nominations for the 2017 Hilton Humanitarian Prize will be accepted from Sept. 15 – Oct. 15, 2016 and should be submitted through the Hilton Foundation website, where more information about qualifications and eligibility can be found.